Does anyone make a quiet helmet? Nope! I've been researching and reviewing just about every helmet known to man. I've found that some are "quiet-er" but seems from my findings the best thing is to always wear earplugs. My BELL Revolver EVO seems pretty quiet, but I ALWAYS wear ear-plugs when I ride. I switched from the Caberg Duke I to the Shoei Neotec. I lost some weight and my face became a little smaller, so the Caberg wasn't really fitting anymore. Also the visor refused to stay up which is very inconvinient when it's warm weather. The pinlock wasn't working anymore so i guess it was time for something new. Kinda dissapointing when a helm ages this fast. Had it for about 3 years. A few days ago i went to a store and did a 2 hour fitting session, the Shoei had a very snug fit all around while still being able to put on the glasses. So i thought about it, so far i have had a new helmet every 2 to 3 years and it has always been around the € 200,00 pricemark. I decided to invest the € 629,00 for the Shoei and hope to be driving with it at least 5 years. So far i did 2 rides with it, pro's -> it moves a lot less, much more quiet, a lot less weight compared to the Duke I, sun visor is perfect, not to dark and not to light. The Duke I was a lot darker which was a hassle in tunnels. Aslo driving with the helmet open is really a lot better then it was with the Duke I. While the Duke I was jerking around the Shoei doesn't move at all. Only downside, i'm using a Uclear HBC100 as a communicationset. Apperantly it doesn't work on the Shoei, they made the Sena SLR to be combined with it. So i guess i'm looking at investing another € 299,00 for a new com set. Still in doubt about that though. The Uclear doesn't have a boom microphone sitting in front of your mouth but uses 2 small microphone's that can be tucked away in the top of the helmet above your eyebrows. For me that was a huge plus. At that price for a Sena Communicator I would seriously consider a Cardo Pac Talk instead. They now have a thin model for your helmet. From what I have read you would be buying into obsolescence by investing in a communicator that does not support mesh and voice commands at this point in time. I know Sena isn't the best choice but appearantly Shoei has a agreement with Sena and made the Neotec II pre-made for that Sena SLR system. I'll look at Cardo if they have a fitting solution, would be better but if it creates the hump on the outside it will probably ruin the silence the helmet has now ? 2005 after crashing with a deer, can't remember which model of helmet but it was a motocross Snell rated hat. I was riding a Suzu DR 650 then. Currently using a HJC CL-17. and HJC CLX-7 with FLY goggles. I mean, it WAS a good helmet... 8 years ago. It WAS an excellent helmet for the money... 11 years ago. But, since KBC left the US market, I can't find things like replacement visors and ratchets. Kind of a bummer, I really liked the paint job on my Force RR. Since the visor won't stay in place on one side, and I live in an agricultural area, it was time for a new lid. Well... It was time in more the emergency sense. The visor would pop off on the right during freeway head checks and send blinding air and debris into my face. Did I mention that it's 11 years old? DOT and Snell, though. So I went to the local CG, looking for an HJC. Walked out with a Sedici Avventura. Fits perfectly so far, DOT/ECE rated, kevlar reinforced fiberglass shell, nice peak to make sure I get full rotation on my head checks and the best part... Clearanced out at $99.97. But with any good comes the bad. This helmet is absurdly loud. Like, drowns out Tool pumped all the way up through my earbuds, loud. What's that? You say something? I couldn't hear you OVER THE WIND RUSHING THROUGH MY HELMET! I gotta save up for something a little better. Maybe I can afford a Shoei in 8 or 9 years if I start now. I'm currently in an HJC CL-17. I bought it a year ago knowing zero about what I needed or wanted and the local dealer I went to was no help. So I ended up in a helmet that was too big; I bough a large and needed a medium. I attempted to remedy this with a new set of cheek pads, which helped, but it's still more loose on me than I care for. Case in point, I was riding in high wind last week when a gust hit me and my helmet twisted on my head. It wasn't enough to impair my vision, but it freaked me out a bit. I've been saving for a new lid and have about $400 to spend. I've ridden enough in the past year to know that I need Pinlock, because here in the midwest it is the only way keep things fog free! I want an internal drop down sun shield because I do night riding and hate swapping shields, regardless of how easy it is. A chroma shield would be ideal, but they are soooo pricey and not widely available! Finally, I'd like it to relatively quiet. I have a feeling anything will be more quiet than what I have now with all the air coming in around my neck. Finally, I want something with some Kawi green in it. My CL-17 is matte black which is basically invisible and kind of boring. But I do not want straight up white or Hi Viz yellow. Basically, I am looking to get a good helmet that fits and is a bit of an upgrade from what I have. My first consideration is the Icon Airflite Qb1 in green, with the new RST Silver Pinlock shield and insert. This wouldn't even be a consideration except for the new Pinlock system they've released for 2019. Runner up is the HJC RPHA 70 ST Grandal in white/green. It also has a drop down sun shield like the Airflite and comes standard with Pinlock and insert. I came from wearing an HJC FG-17 size large, now wearing a Shoei GT-Air size Medium. The HJC felt like the right size at first but loosened up a little bit and was actually too big. When I bought it, the medium HJC was too tight. Proper fitting means trying on several different brands and models to find what shape is right for you. The Shoei feels a bit snug, but is actually correct. Not painful, but it doesn't move around. Different thickness cheek pads are available too. It is a very quiet helmet, light weight, and aerodynamically very stable. Pinlock, built in sun visor (love it! ), superb ventilation. Yes, it is a very expensive helmet, not what I had intended to spend! I was looking at getting another HJC but couldn't find one that fit me properly. My suggestion is to try the Shoei and a bunch of others, then spend whatever it is for the one that fits your head and has the features you need. I wear a Shoei RF-1200 and absolutely love it! Sedici Strada from Cycle Gear does most of what you want. For $400 you could buy 2. I considered the Flagger TC-4 in Kawi green. But they are really, really hard to find in medium. As for spending more, that's not really an option. There are a ton of sub $400 options, with some Shoei clearance helmets being possibilities. I understand helmet fitment and the need to try several on. I guess I want to see what you all are using at this range that you either really like or really hate. I just noticed the header, along what I wear. I currently wear a Sedici Aventura in black/yellow. There are a few reasons I like this helmet, and a few I don't. Likes: low price ($79 on clearance), ECE safety tested, kevlar/fiberglass shell, visors are $30, and that's for the mirrored one. Dislikes: no vent control (always open), the peak that was a selling point is noisy and grabs the wind, the yellow is fading, wind noise is unbearable without earplugs, no ratchets on the visor, can't remove the peak unless I switch to goggles, no replacement parts aside from visors, had to hot glue the rear shoulder roll thingy because the glue broke on the first day, it's too big to fit in the factory panniers... There's more. If I had it to do over, I'd still buy this helmet. It'll make a good backup when I replace it with am RF1200. 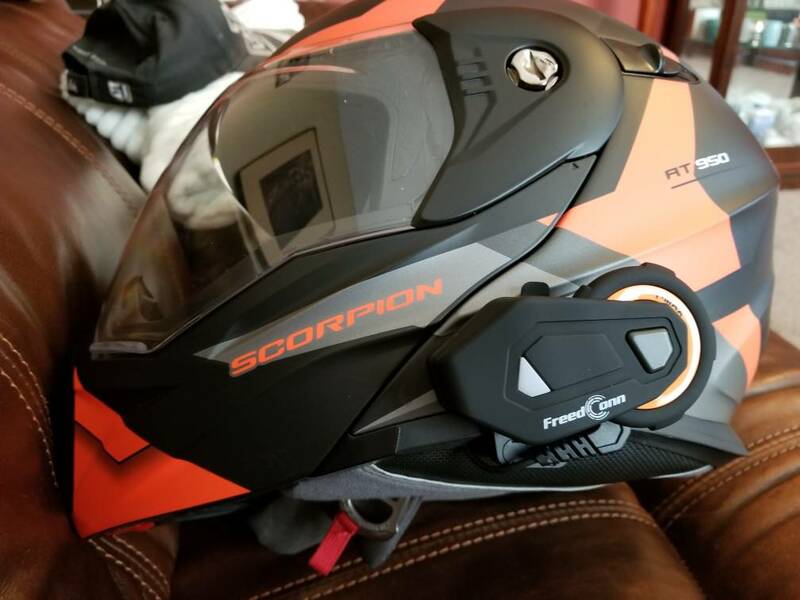 I'm looking at the Scorpion Hi-Vis EXO T510. It's under $250, and seems to have the features I'm looking for. I'm prepared for it to be louder than the Arai I currently have, but other than that, it looks like a good helmet for a great price. but I ALSO have another in each place. In AZ it's a silver full-face "agv" K3 which I wore for a ride yesterday. Nice helmet w/ GREAT ventilation, but I missed being able to put-on and take-off the helmet w/ my eyeglasses ON. Last edited by fasteddiecopeman; 03-30-2019 at 10:30 AM. I wear a Scorpion AT950. When I first purchased it I was after 3 things. First a quality helment to protect my noggin, second, a helmet which fit well and third, a helmet which closely color matched my Orange Versys. After looking an several helmets, I made this choice and I like it. Super comfortable for us with rounder heads. Removable pads. 3/4+ format. It just works well for me. Love the visor - and it doesn’t rise. Can get them for about $400 today. Mine was $550. Still a great value. F1 drivers use Arai for a reason! Last edited by Shibumik; 03-29-2019 at 06:49 PM. Ordered my helmet and shield...both came in on Friday. 2019 Icon Airflite QB1 in Kawi green with RST Purple visor. Loving the helmet so far! Arai just didn't fit my head and some of the others (like HJC RPHA) I was looking at had iffy safety ratings like no Snell and poor Sharp ratings. I wanted to like the Bell Star but the visor is only open or shut not incremented like the RF1200 so I didn't want that. Last edited by denimnerd99; 04-16-2019 at 05:10 PM.